Patient presented with significant upper lid heaviness and bagging under the eye. This gives the look of being very "puffy". 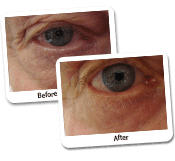 This excess skin and fat on the upper and lower lid can be removed by performing a Blepharoplasty procedure. Notice the huge improvement from patients before photo. The puffy skin on the upper lid has been removed and the patient now has a natural looking crease. This has opened her eyes up dramatically. The lower lid has been smoothed by removing excess fat. 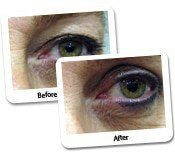 Notice the minimal scarring of this procedure and the client looks younger and fresher. 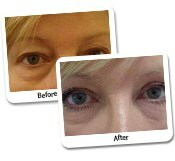 The case study above is a prime example of how eyelid surgery can make a patient appear younger and more radiant. It also displays some of the problems patients can experience, leading them to choose eyelid surgery to correct to problem. Below, we have explained this case study in a little more detail. We also explained how eye surgery has corrected the patient’s problems. 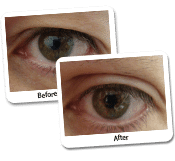 So, if you are considering eyelid rejuvenation, reading the case study below will provide you with a lot of essential information. What Are Common Problems Patients Experience Around the Eyes? Excess fat and skin on the upper eye can leave it looking quite puffy and tired, no matter how well slept the person may be; this excess skin can be removed surgically using a specialised laser. The laser is very fine and allows Dr Lanzer to take the maximum amount of tissue out, with minimum bleeding and trauma to the area. Many people have bulging on the lower lid which casts a shadow, causing the person to look even more tired; this can be reduced through a Lower Blepharoplasty, and Dr Lanzer may suggest the use of facial filler or fat transfer to the cheek to provide support to any skin laxity under the eyes. Some individuals find that they wake up with puffy eyes in the mornings. We have found that removing the excess fat can help to reduce this from happening. Dr Lanzer chooses to remove this fat through an incision on the inner eye lid rather than cutting the skin on the lower lid; this means that there is less down-time, no scar and less chance of other complications (such as infection) post-surgery. Combining the Blepharoplasty with other procedures such as Fat Transfer or facial fillers will leave you rejuvenated and refreshed, like you have just come back from a relaxing holiday. 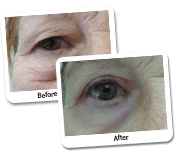 Are Additional Procedures Needed to Keep the Results from Eyelid Surgery? As a nurse that has worked alongside Dr Lanzer for years and thus far have never seen a patient require a touch up or repeat procedure. The procedure is done in our day surgery centre and patients are able to go home that night. Some patients may have a drooping upper lid and instead of having a brow lift or a full face lift, a Blepharoplasty procedure will allow you to obtain an aesthetic looking eye with minimal down-time and scarring. How Can I Book an Appointment for Eyelid Surgery at the Dr Lanzer Clinic? Patients can easily book an appointment at the Dr Lanzer Clinic for eyelid surgery. You can book your appointment via telephone, or you could use the email or chat function on the Dr Lanzer website.